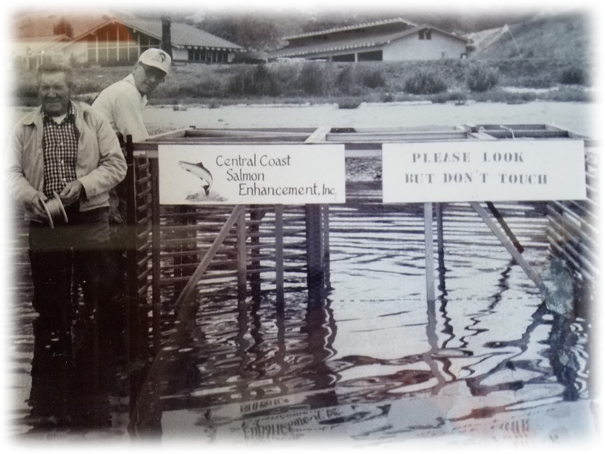 Central Coast Salmon Enhancement (CCSE) was established in 1983 to increase the ocean salmon population for sport and commercial fishing. A small and dedicated group of ocean and stream anglers built a floating pen and bought salmon from a hatchery in Minnesota to start the county’s first and only ocean net pen operation in Avila Bay at Hartford Pier. For almost 25 years, millions of salmon were added to ocean stocks to be caught and enjoyed by anglers. In the late 1990’s, CCSE began "Trout in the Classroom" to connect local students to local creeks and their native fish and wildlife. Kids raise and name their trout before release into nearby lakes, while teachers receive standardized watershed science curriculum. Through programs like Trout in the Classroom, CCSE and our future generations inspire each other to "think like a watershed:" What happens when rainfall drains off of roadways, playgrounds and buildings? Where does trash go when it's not properly disposed of? When kids can use their imagination to see life through the eyes of a native trout, they understand how their actions can impact wildlife habitat and the entire community. CCSE had already begun to shift our mission toward restoring the steelhead trout population when the net pen program ended in the late 2000’s. Conducting watershed assessment surveys of Central Coast creek habitat, has grown into watershed plans for many Central Coast creeks including Nipomo Creek, Arroyo Grande Creek, Pismo Creek and Estuary. To be dedicated to the local creeks means being connected to every watershed in the Central Coast. Through relentless commitment to seeking input from stakeholders that continues to this day, CCSE drafted a library of watershed management plans so every community could have the knowledge and resources to restore their local creeks. The process of learning what it will take for wildlife and people to thrive together in the decades to come has allowed us to develop wonderful partnerships with landowners, government agencies, other environmental nonprofits, and smart businesses. Together with our partners we are positioned to help lead Central Coast communities into a future in which the interests of humans and natural ecosystems are more balanced. As we begin a new chapter in our 35-year journey, we do so as proven innovators in watershed science with the vision, scientific rigor, passion, and ability to inspire others toward a “fish-friendly future” on California’s Central Coast.